You Want to do WHAT this Weekend?! It’s no secret that college students sometimes choose to go home on the weekends. If you were part of what seemed like the 10% of campus that chose to stay at your home away from home for this beautiful Columbus Day weekend, then you might agree with me when I say campus was just a little too quiet for my liking. However, if you are creative enough, weekends on campus are fun, and they are what you make of them. I chose to make the best of it with some great friends, and made some great memories. We are lucky enough that Saint Rose is located in a place that turns even more beautiful as the leaves change. Fall in Upstate New York is my absolute favorite thing, and I’ll take every opportunity I get to spend time in beautiful fall weather. 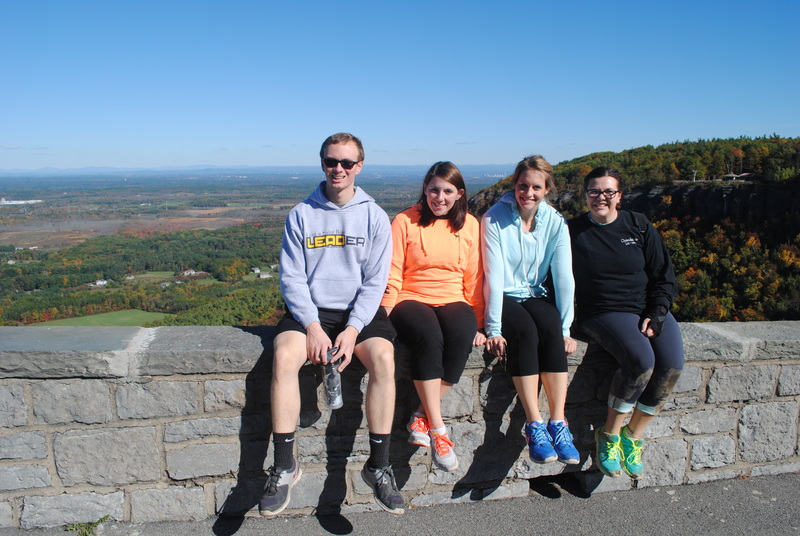 My friends and I took advantage of this and went on a hike in Thacher Park, located about 30 minutes from campus. It was an awesome way to relax, spend some time with some great Saint Rose friends, and enjoy the beautiful New York autumn trees that I love! Alex, Brittany, Katie, and Myself at Thacher Park! As far as being on campus, I like to think of the weekends as a time to choose your own adventure. You can choose to lay in bed, watch Netflix, and do homework (which is always necessary), or you can have some fun, think outside the box, and have a picnic in the quad! Sometimes my favorite game to play is “How long can I possibly sit in the Dining Hall?”. Check out what campus events are going on during the weekend! Late Knight sponsors awesome and safe weekend activities for all students! Turn your Residence Hall’s lounge into a movie theater! Grab some friends in your building, make popcorn, turn on a movie, and relax! Use the free CDTA bus pass you get on your St. Rose ID, and go explore Albany. Our campus is in a really cool city, and I love discovering new places I haven’t been to yet. Make homework fun – Let’s be real, no one wants to study, but it has to get done! Try taking Sunday mornings and get into a routine of Dining Hall brunch and a trip to your favorite study spot with your friends. SLEEP and RELAX. I know I can get pretty stressed during the week with classes, meetings, homework, and everything else the week throws at me. Don’t forget to take some “you” time, and do what makes you happy, even if it’s binge watching Parks and Recreation. So what’s your favorite thing about your weekends at Saint Rose? Leave me a comment and let me know!